By Brian Voo in Mobile. Updated on April 9, 2018 . Are you one of the millions who welcomed iOS 6 but hated the fact that Google Maps no longer works on your iOS device since the update? 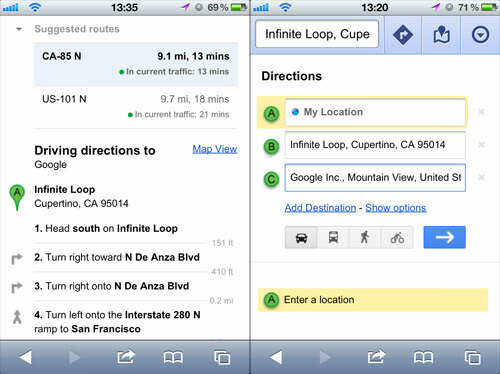 The app may be gone, but did you know that there is a web version of Google Maps that you can use on iOS 6? Add a bookmark to the page to your Home Screen and no one will be the wiser. However, if you’re sceptical about using the mobile version Google Maps, we’ve found an alternative app called Maps+ which uses Google Maps and actually works similar to the original Google Maps app. 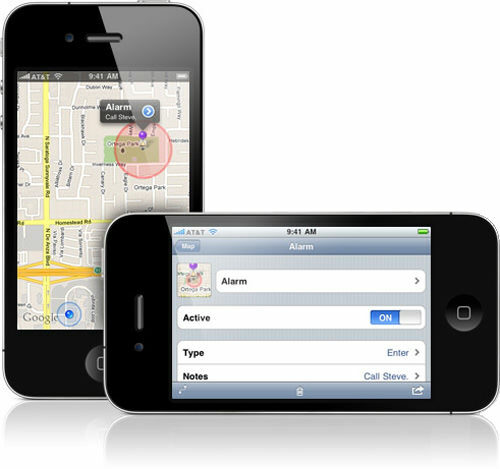 In addition, you get almost every function of Google maps where you can search online for locations, add pins or bookmarks and do a little more with the GPS tracking and location-based alarms. 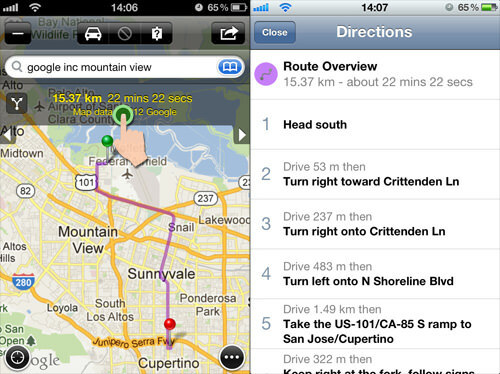 We’ll take a look at these two alternatives to the dreaded Apple Maps. 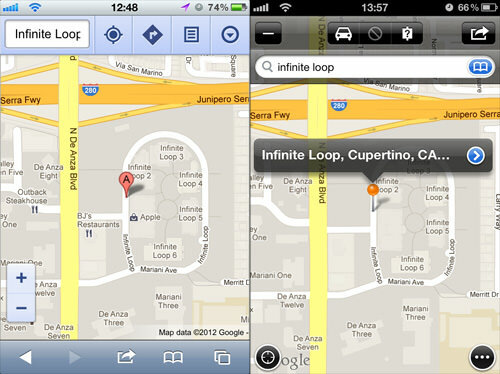 All you have to do is to launch Safari on your iOS device and go to the website maps.google.com. Then, search and use Google Maps like how you would on the app. 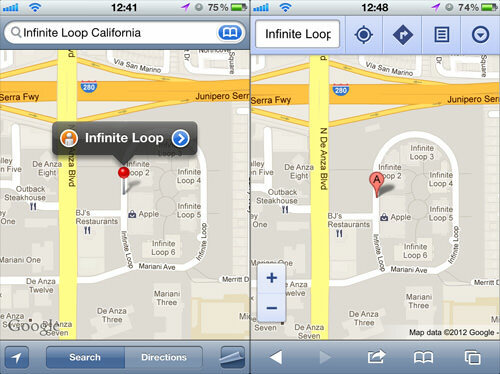 You will find a resemblance in both the previous Google Maps app (left) and the web version (right). With your GPS on, you can use the web app to locate your position, find directions to a destination, mark your favorite locations etc. You can also add more locations to your journey and pick your routes – basically it’s like using Google Maps on your desktop, but with added mobility. Another handy feature is the live traffic feed. You can locate this under ‘Layers’. Green indicates fast moving traffic, yellow slower traffic and red means that particular road is congested or slow-moving. Features like live traffic feed and multiple destinations are not found in the old Google Maps app. 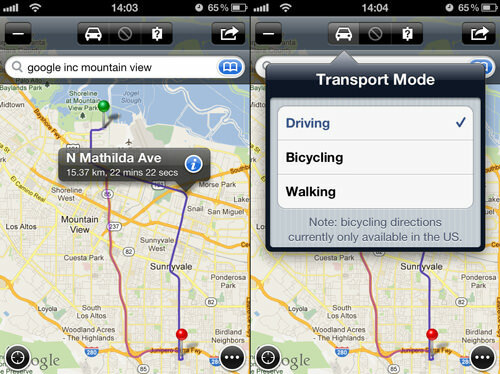 If you prefer an app instead of a web app, then try out Maps+. First, download it from the Apple App Store. There is no registration required to use the app, so you can start using it once it is installed. It has a different user interface but they are pretty intuitive if you are a regular user of Google Maps. Just like using Google Maps, you first have to search for the location you want to go to. Then, tap on Route Here and it will display the route from your current location to the destination you had located. If you want to search for directions between 2 locations and not from where you currently are, then tap on Drop Route Pin and determine the starting location with a Start Pin, and the final location with an End Pin. The Transit Pin is used when you need to add another location to your journey. 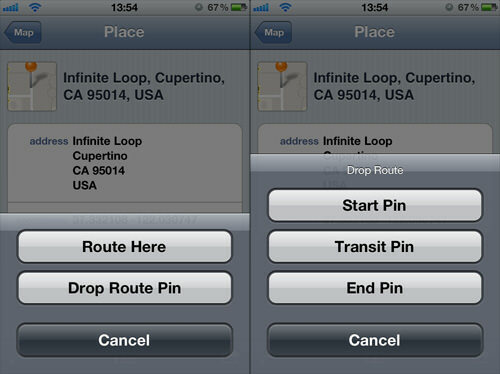 Transit Pins will be the stopovers between your Start location/pin and your End location/pin. You can choose a driving route as there would be a few depending on what is available.Tthe driving route you select will be in a darker color or shade. At the moment, bike routes are only available in the US; and there are no bus routes, so you have to make do with driving or walking routes. When you press the ‘information’ button on the selected route, it will take you through the roads that the route will take and you can navigate by tapping the left and right arrows. You can also tap the header and it’ll give you the route directions in a list. 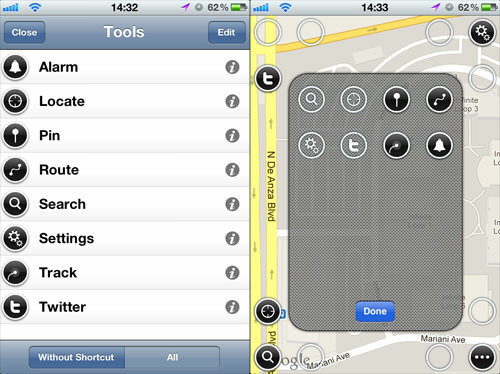 Maps+ has a few useful tools which can be accessed while looking at the map. For easy access, you can add and put them on the 4 corners of your screen. One fun thing you can use with Maps+ is that you can set location-based reminders. Once you’ve determine the location of your alarm, just press the Alarm button (bell icon) and it’ll help remind you to run errands when you enter or exit a particular area. There is also a Track feature where you can track your movement and duration on the map – ideal for hikers and bikers to track their whereabouts and prevent from getting lost. 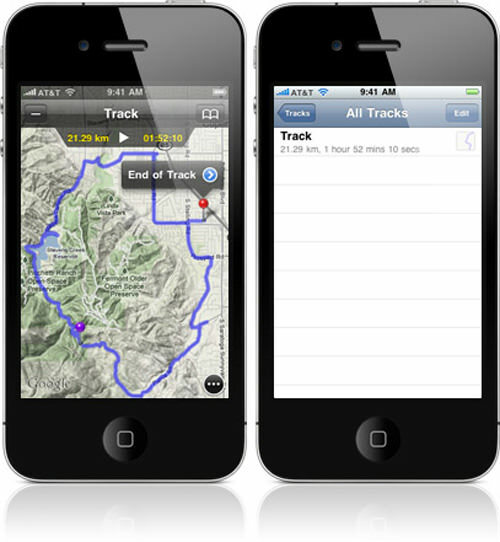 The free version of Maps+ comes with some limitations, you have limited bookmarks and alarms to set, and the Track option only allows you to track up to 2 km. Plus, its Twitter features are locked as well. The paid version goes for $2.99 but if you just need a simple map app, the free version gets the job done. So how what is the verdict in your book? 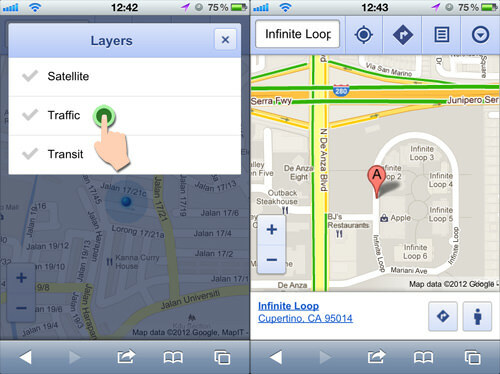 Will you go for the web version of Google Maps or would you prefer an app you can run on your iOS device? Let us know in the comments.